lead (?) - Sunday ANOUNCER Good Evening, Ladies and Gentlemen, this is _________ of KBURW and for the next 15 minutes, we are bringing you a special public service broadcast about a subject that is uppermost in the minds of the thinking people of the world--- atomic energy. We have in the studio this eveningx Mrs. James S. Schramm, Chairman of the Burlington Atomic Energy Week Committee, and Mr. Edward R. Trapnell, Associate Director of Information for the United States Atomic Energy Commission, Washington. SCHRAMM You might remind our listeners, Mr Dechene(? 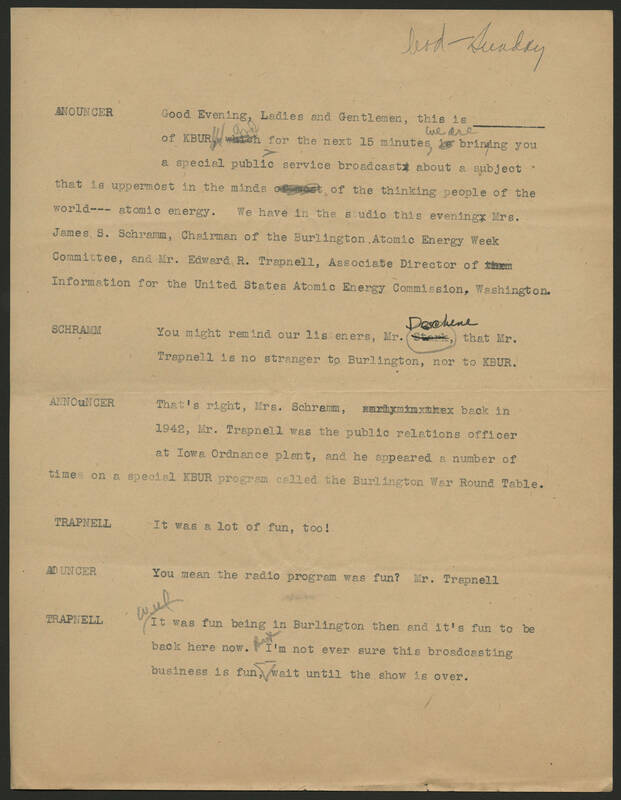 ), that Mr. Trapnell is no stranger to Burlington, nor to KBUR ANNOuNCER That's right, Mrs. Schramm, back in 1942, Mr. Trapnell was the public relations officer at Iowa Ordnance plang, and he appeared a number of times on a special KBUR program called the Burlington War Round Table. TRAPNELL It was a lot of fun, too! AOUNCER You mean the radio program was fun? Mr. Trapnell TRAPNELL Well It was fun being in Burlington then and it's fun to be back here now. But I'm not sure this broadcasting business is fun, wait until the show is over.